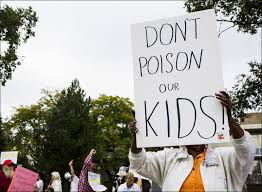 Recent reports of Lead in drinking water in Flint, Michigan and Newark, NJ, have many of us worried about whether we or our children have been subject to lead and potential heavy metal poisoning. The New York City Department of Environmental Protection found elevated levels of lead in tap water samples at some homes with lead service lines (homes built before 1961 may have lead service lines), or internal fixtures and plumbing that contain lead, or that have internal plumbing joined by lead solder (plumbing installed before 1987 may contain lead solder). This is a serious concern if you live in the New York area. Lead poisoning occurs when you absorb too much lead by breathing or swallowing a substance with lead in it, such as paint, dust, water, or food. Lead can damage almost every organ system. In children, too much lead in the body can cause lasting problems with growth and development. 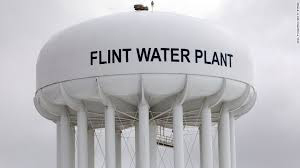 Lead primarily enters drinking water because of corrosion of lead-containing plumbing, including pipes that connect household plumbing to the city’s water mains, solder on copper pipes, and faucets. Although regulations have been put in place to reduce the lead in plumbing, your residence may still contain plumbing and fixtures with lead content if they were installed before these rules came into effect. 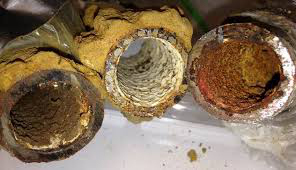 When water stands for several hours or more in lead service lines or plumbing systems containing lead, some lead may dissolve into the water. Lead is everywhere, including dirt, dust, new toys, and old house paint. Unfortunately, you cannot see, taste, or smell lead. It is estimated that more than 3 million workers in the United States are at risk for toxic lead exposure. 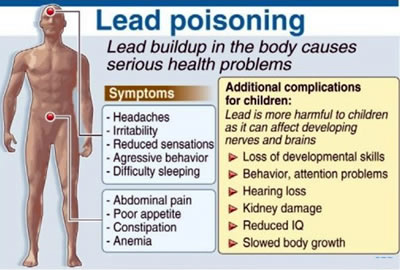 Very high levels of lead may cause vomiting, staggering walk, muscle weakness, seizure, or coma. A blood lead test can help identify whether a problem exists. Over 10 micrograms per deciliter (mcg/dL) is a definite concern. Levels between 2 and 10 mcg/dL should be discussed with your doctor. In many states, blood screening is recommended for young children at risk. At Patients Medical, we have found that Patients who come in for potential lead level testing, frequently suffer from other forms of heavy metal poisoning also. 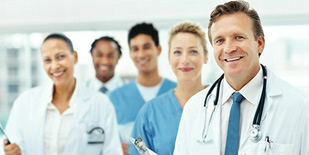 We strongly recommend that you do a complete urine analysis for all heavy metals in your system. Analysis of elements in urine provides diagnostic information on potentially toxic elements such as lead, mercury, cadmium, nickel, beryllium, arsenic and aluminum, and assessment of the efficiency of renal resorption of essential elements such as magnesium, calcium, sodium and potassium. Urine element analysis is an invaluable tool for the diagnosis or confirmation of toxic element burden and monitoring of detoxification therapy. Treatment of iron, calcium, and zinc deficiencies, which are associated with increased lead absorption, is another part of treatment for lead poisoning. The chelating agents used for treatment of lead poisoning are edetate disodium calcium CaNa2EDTA), dimercaprol (BAL), which are injected, and succimerand d-penicillamine, which are administered orally. 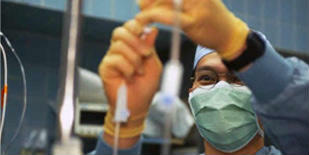 Chelation therapy is used in cases of for people with blood lead levels above 25 µg/dL. 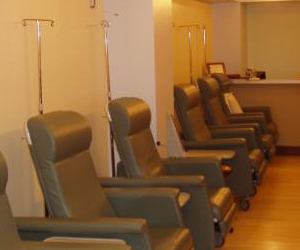 Chelation infusions are administered by slow IV drip, circulating through the blood stream treating the entire arterial system removing undesirable metals from the body. Some metals such as lead, mercury cadmium and iron are poisons. All metals, even essential nutritional elements, are toxic in excess or when abnormally situated. People with higher lead levels have a greater risk of long-lasting health problems. They must be followed carefully. A complete recovery from chronic lead poisoning may take months to years.